Soisson was a member of the highly influential Art Brut movement which included Jean Dubuffet, Corneille and Brassai, and was a radical group that proposed a subversive challenge to culture itself and the conditions of the production and diffusion of art. Refusing to comply with any facile techniques, and emphasising above all spontaneous primitive elements, they exalted the real by reducing it to schemas and archetypes. Soisson’s intention was that drawing should deny the figure any particular shape, that on the contrary it should prevent the figure from assuming a particular form, that it should keep it within the bounds of a general concept, of something immaterial. In this magnificent example “Le Majordome” the figure adopts the appearance of a surreal fantasy and typically assumes totemic proportions whilst wonderfully demonstrating the bold immediacy for which Soisson became renowned. Having attended the École des Beaux-Arts in Montpellier, Soisson became a professor of drawing from 1952-1962. His fascination with Surrealism and the expression of the sub-conscious lead him to join the Société de Pscychopathologie de l’Expression whose sentiments shared affinities with the avant-garde Art Brut group with whom Soisson also participated during the 1960’s. Soisson associated closely with the leading member Jean Dubuffet who actually gave Soisson the stretcher for this canvas and Dubuffet’s old exhibition label is still visible on the back. Soisson exhibited regularly with the group including at the Menton Biennale and Meubles Tableaux at the Centre Georges Pompidou in 1977. 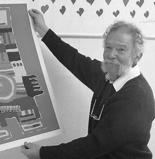 During his remarkable career Soisson held numerous one-man shows including: Galerie Art Décoration, 1954; Cercle Lelian, 1955; Hotel de Ville, 1959; Galerie Denise Manson, 1965; Galerie Regards, 1973; Galerie Lahumière, 1975; Galerie Bonafous Murat, 1978; Kunstmuseum Denmark, 1978; Key West, USA, 1986.